Our name is who we are. It’s a simple truth, but the art of naming or renaming an organisation is one of the more esoteric aspects of branding. Names dutifully carry the weight of meaning bestowed by their creators while bearing the extra load of words and actions that they become associated with. Our name is who we are as an organisation but can also tell others something about our character. It’s this mix of intention and association that makes them so powerful. Brand names can come from a sudden flash of inspiration but more often are forged in an intense process of research, development, consultation and finally, concensus. However rigorous the process or steadfast the logic, emotion holds the cards when making the final call. Why is this? In our experience, an organisation’s name says something about the nature of the people behind it. The emotions attached to changing that name, whether pride, fear, happiness, stem from the fact that a name will mean different things to different people. Name and reputation are entwined in a continuous symbiotic dance. We can account for many differences in how words in a name might be interpreted: sound, literal meaning, cultural connotation. But it’s the future actions and events that become associated with that name – successes or otherwise – that will either increase or reduce its perceived value. Let’s look at three approaches to renaming an organisation. Telstra naming approach: neologisim – forming a new word by combining parts of ‘Telecommunication’ and ‘Australia’. 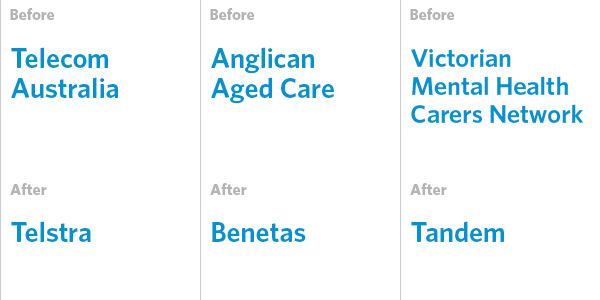 Benetas naming approach: derivation – forming a new word from several Latin words, meaning ‘a good age of life’. Tandem naming approach: metaphor – applying the literal meaning of a word to convey the broader idea of working alongside another. Just as every organisation exists within an industry or sector, organisational names exist relative to others in their environment. Virgin was all the more daring as the name of a new airline because its 1984 contemporaries focused on neutrality and reliability, which defined the approach for naming airlines at the time. Start by establishing a picture of trends and approaches for naming organisations similar to yours. Will you choose a name that puts you on Main Street along with the other big brands or will you settle on the fringes and do things a little differently? The most important communication function of a name is to differentiate the organisation from others, so it’s important to consciously decide on an approach that best matches the spirit of your organisation. Once you settle on a new name, invest the time and energy to nurture and promote it. Stand behind your decision and remember that recognition – a large part of the value of a name – and endearment are earned over time. Because a name gradually takes on the patina of the words and deeds associated with it, periodic sentiment checks are a good way to ensure that the gap between what a name means to those within an organisation and what it means to external stakeholders is kept to a minimum.